"Oh yeaaaahhh!" Any pro-wrestling fan worth their salt knows who "Macho Man" Randy Savage was! Whether playing the role of beloved face or nefarious heel, he was a consummate entertainer. His classic match ups against the likes of Ricky "The Dragon" Steamboat and Ultimate Warrior are the stuff of legends. 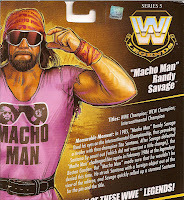 Macho Man was truly one of the greats and today we're taking a look at his first WWE Legends figure by Mattel. A figure I'm sure will be highly sought after as a tribute to an icon. 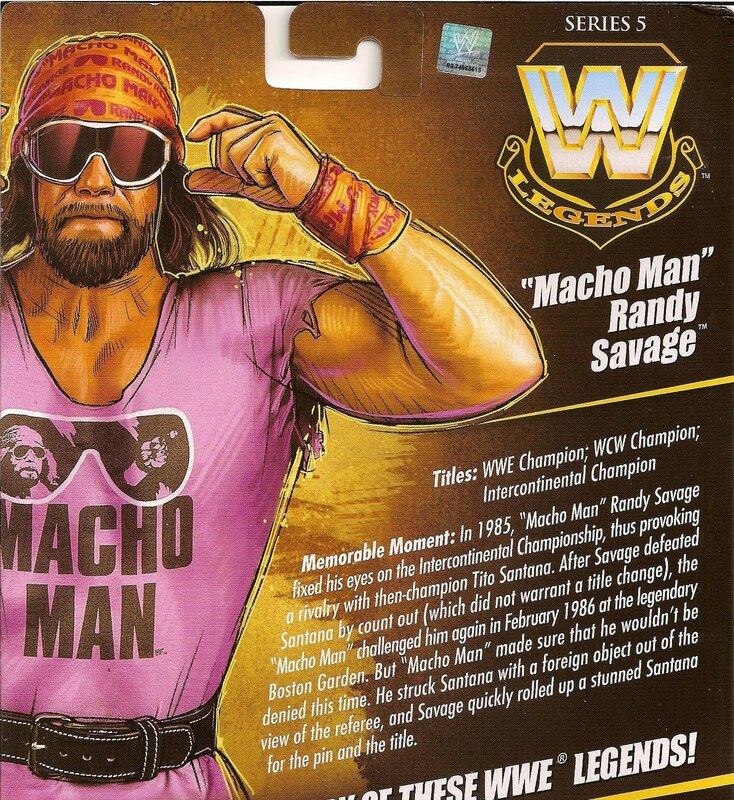 Even though this is Savage's first figure in the "Legends" line, it's the second Macho Man by Mattel. The first appearing in the "Defining Moments" deluxe line and recreating his attire from his classic WrestleMania VII confrontation with Ultimate Warrior. This Legends figure captures Randy in the early days of WWF. He reuses the head sculpt from the DM figure, featuring a blank expression. I prefer a lot more emotion in a Macho Man figure. It's Macho Man, after all! His body is adequately muscled and very toned (this upper body was previously seen on series 3's Brian Pillman), but not as bulky as figures like Warrior. He's sporting the tall boots we've seen on other Legends like "Hacksaw" Jim Duggan, but Savage sports the larger knee pads. His knee wraps are painted on each leg underneath the knee pads, just like his wrist and finger tape. The level of articulation is the standard for the line, although the range is limited in some areas because of his larger muscle groups. Macho includes three wardrobe accessories, not counting his knee pads which are separate pieces, but won't come off without some work. The included accessories are a "Macho Man" t-shirt, ski-goggle-like sunglasses and "Macho Man" bandanna. The t-shirt is made of cloth with a Velcro strip along the back. I'm still a fan of using cloth shirts for these figures, and I particularly like how this one turned out. The glasses are molded in solid white plastic with the lens portion simply painted in black. Savage's bandanna is also molded in plastic and is made to fit over his head without any notches or pegs to secure it. It'll sit on his head fine, but will fall off easily if you start moving him around. A redeco version of this figure is available in a "WWE All-Stars" set with John Morrison. That version features green shorts and blue knee pads, a horrendous combination in my opinion, but it includes two different bandannas. I really like the way the orange and yellow work together for MM's outfit and the purple t-shirt fits in nicely, too. When this figure first debuted, I knew it was a must-have, and while the DM version tempted me incessantly, I held out for this version. Unfortunately, obtaining it became a bittersweet moment as it joined many of the figures in the Legends series as a tribute to a fallen hero of the squared circle. Savage passed away suddenly last May after suffering a heart attack while driving. His wife, who was riding in the passenger seat, was able to steer the vehicle away from on-coming traffic, crashing it into a tree off the road. Like many fans of "Macho Man" Randy Savage, I was saddened by the news of his deah, and acquiring this figure meant so much more than just adding another little plastic man to my collection of pro-wrestlers. Thanks for all the memories, Randy, you will be forever missed.